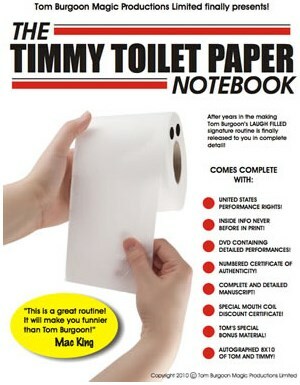 If you're looking for a trick with an "ordinary object," Timmy Toilet Paper routine is a perfect fit. After all, a roll of toilet paper is something that kids and adults use every single day. Perhaps that's why this is Tom Burgoon's funniest closing routine that's been part of his show for years. When you learn how to make a roll of toilet paper come to life by adding some simple artwork, you'll pack dozens of extra laughs into your show. Tom Burgoon's Timmy Toilet Paper Routine is packed with laughs and will fit easily into any show. A limited number of authorized notebooks for AmazeKids have been reserved. Don't miss this opportunity to own this one-of-a-kind comedy routine!